The fall is a great time to see Oregon and Janet and I decided to hit the road for a few days driving down the coast through Redwood National Park as far as Eureka. 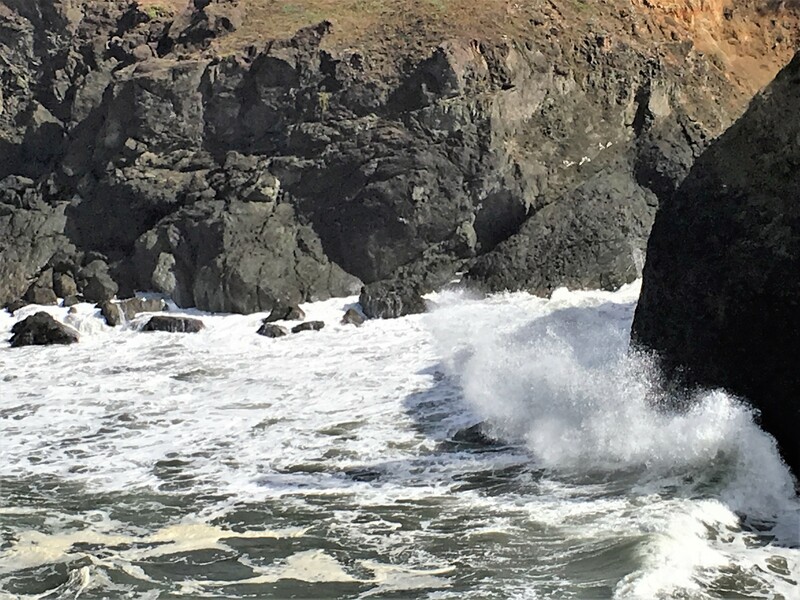 Along the way, we enjoyed a few superb hikes and marveled at the coastal scenery. 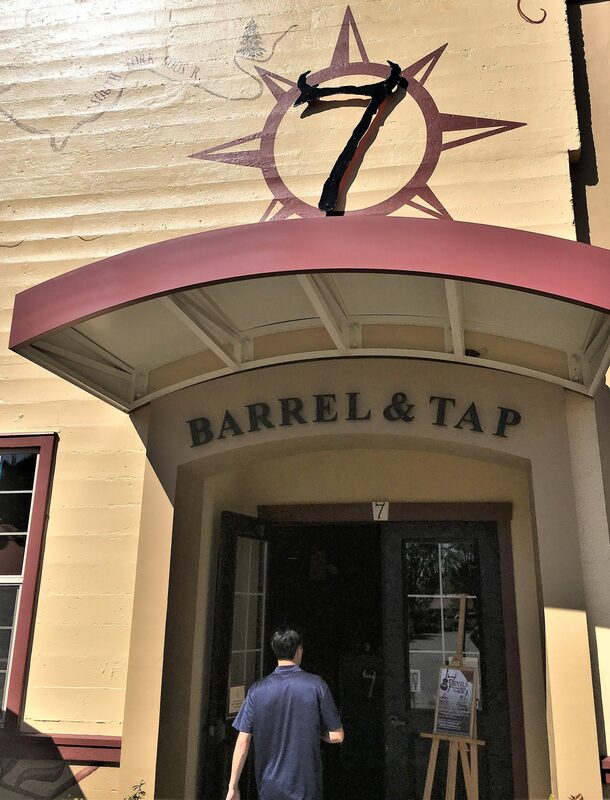 And, of course, in furtherance of Thebeerchasers Tour of Bars, Taverns and Pubs, we visited twelve breweries, one bar and one bottle shop along the way – all of which were either on Highway 101 or close by. 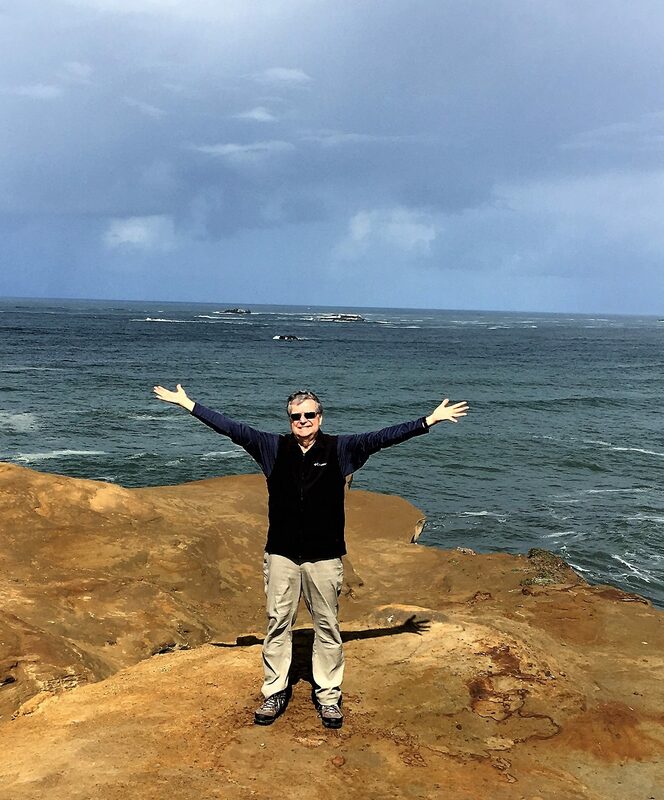 And we were thankful for the efforts of the late Governor Tom McCall and his foresight in preserving the Oregon Coast and the numerous outstanding Oregon State Parks along the way he championed. 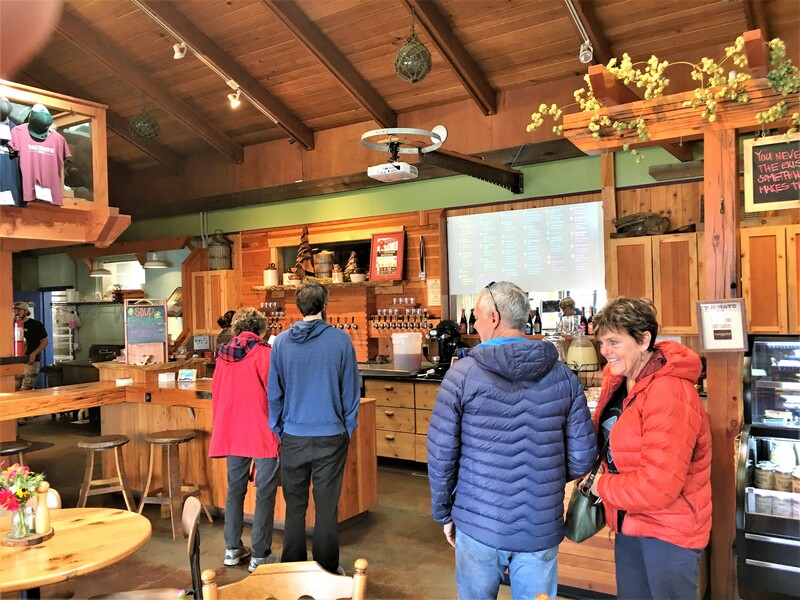 The breweries we visited included Yachats Brewing, Defeat River Brewing in Reedsport, Seven Devils Brewing in Coos Bay, and Bandon Brewing, the Beverage Barn (bottle shop) and the Broken Anchor Bar and Grill in Bandon, Arch Rock Brewing and in North Bend Chetco Brewing in Brookings. We tasted some good beer and by always sitting at the bars, met great people. 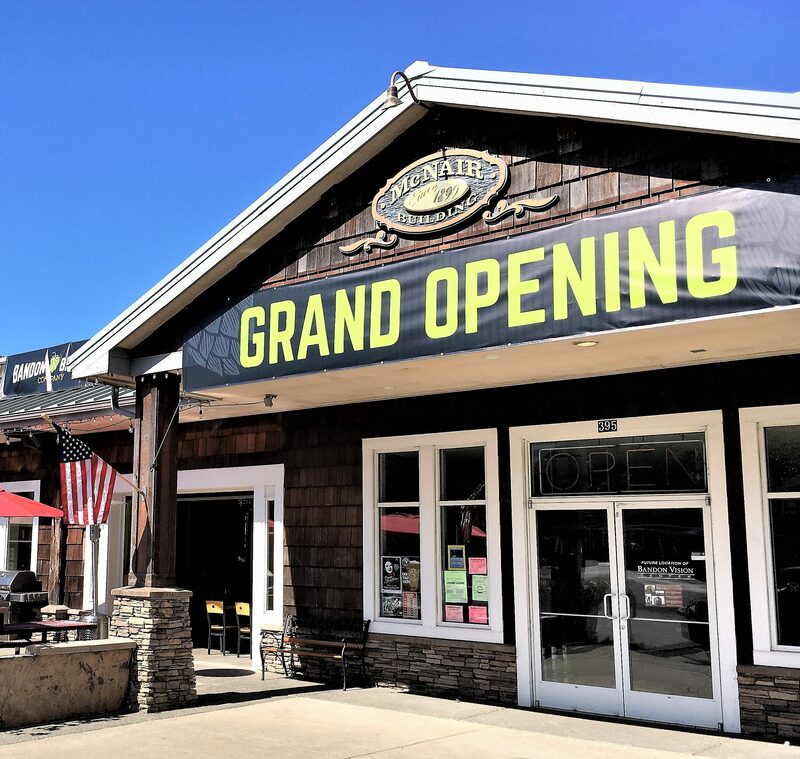 While it is hard to compare, our favorite brewery was Mad River Brewing closely followed by Yachats Brewing and Farmstore as will be explained below. 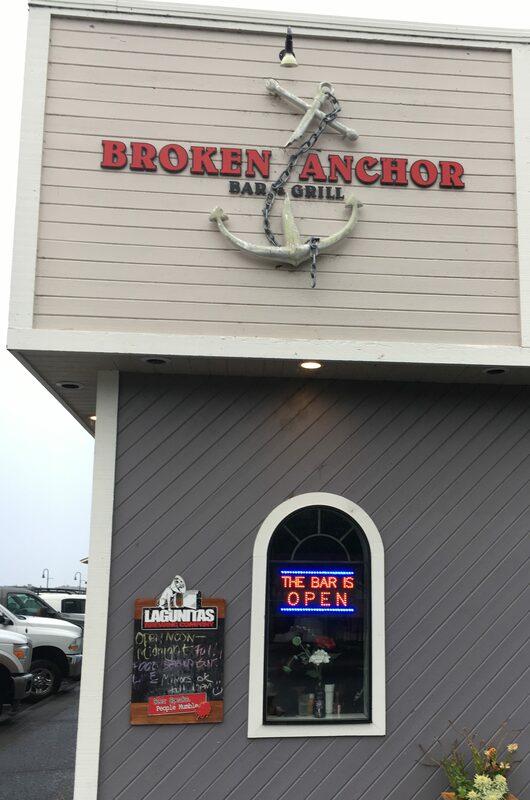 And we loved the one bar visited – the Broken Anchor in Bandon. 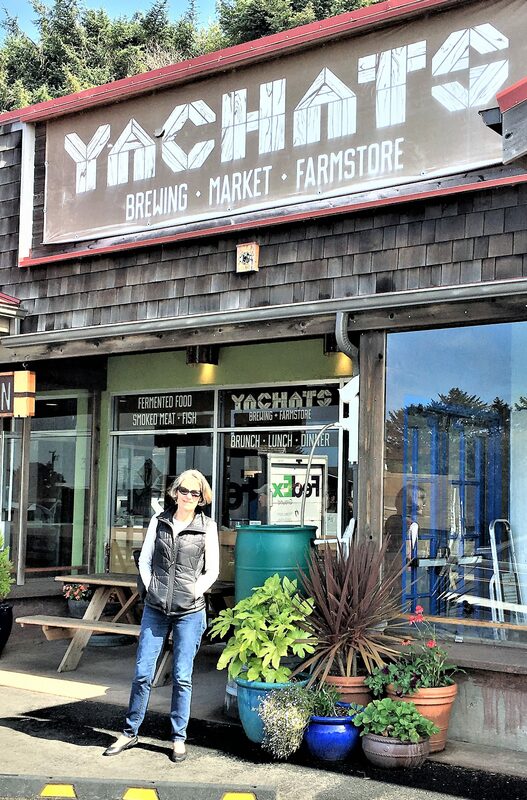 We started on a positive note with the first stop being Yachats Brewing. The quaint building right on Highway 101 with a great view, uses historic building materials in this reconditioned bank and at Tuesday lunch it was bustling. A number of people were enjoying the patio, while choosing one of the thirty beers on tap. Jeremiah, our bartender and server, was a great guy, explaining the roots of this young enterprise going back to 2013. Janet liked her Camp One IPA (an American IPA) while I downed a Thor’s Well India Pale Ale as we listened to Crosby Stills and Nash on their play list. The food was great with a combo of quinoa soup and the barbecued chicken sandwich rating an A+. 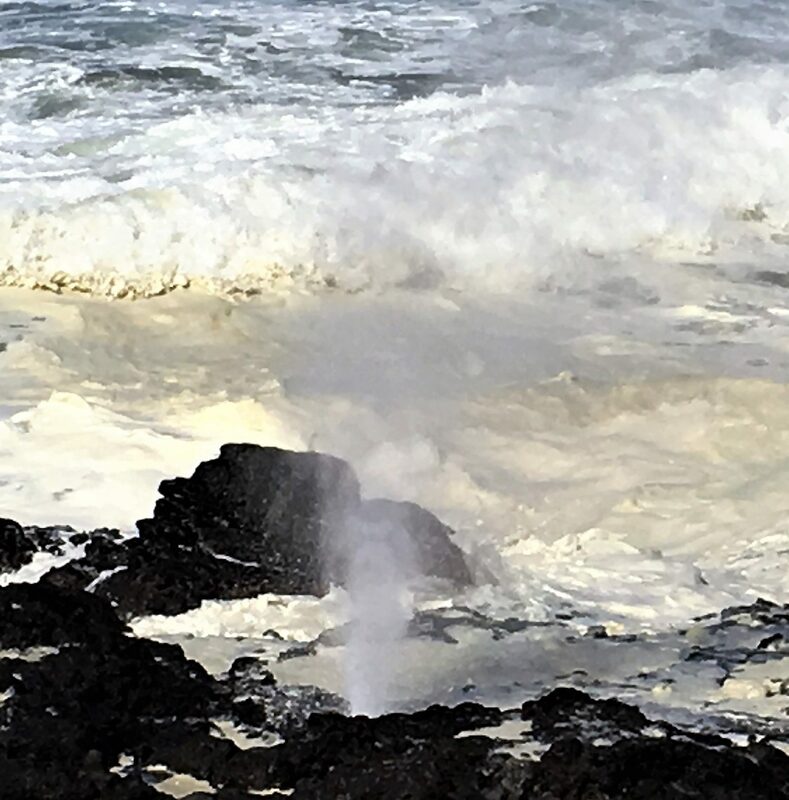 My choice of beers was appropriate, because we then stopped to see the Thors Well sink hole, the Spouting Horn and the Devils Churn at Cape Perpetua on the highway, which was worth the stop. 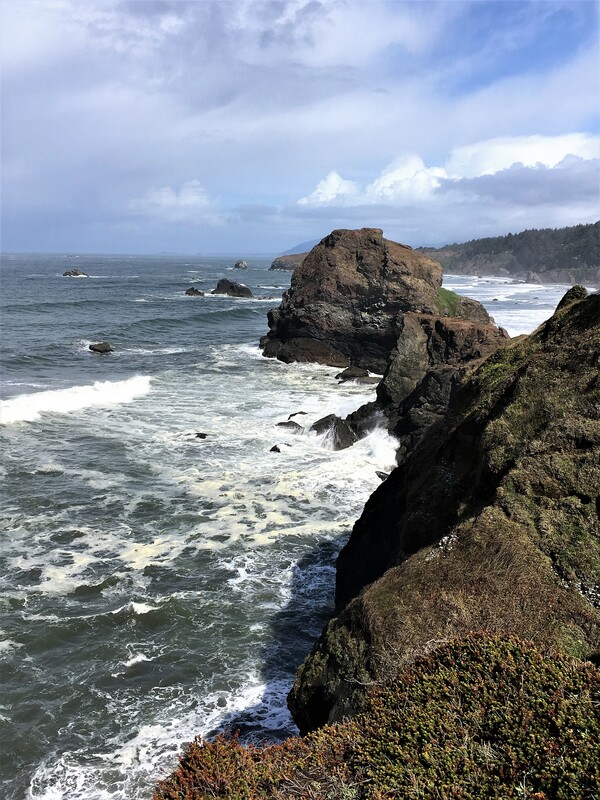 We had read an article by Oregonian reporter, Jamie Hale on hikes along the southern Oregon Coast which was a great reference. 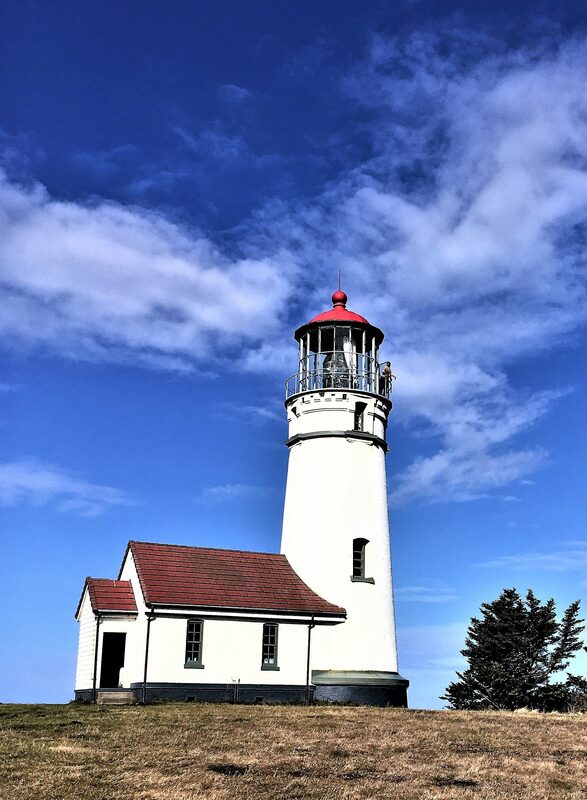 We stopped to see the beautiful Cape Blanco Lighthouse and then pushed on to Harris Beach and Cape Sebastian State Parks. 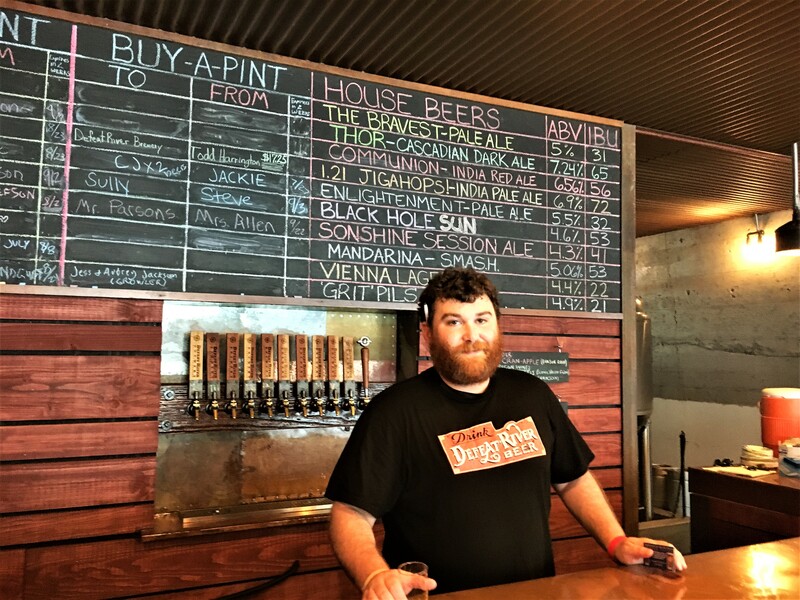 At Defeat River Brewing near Reedsport, our bartender, Jared, poured us The Bravest, a pilsner inspired IPA, and we learned about another home-brewing effort by two partners which culminated in Reedsport’s first commercial brewery in 2016 in another reconditioned historic building. 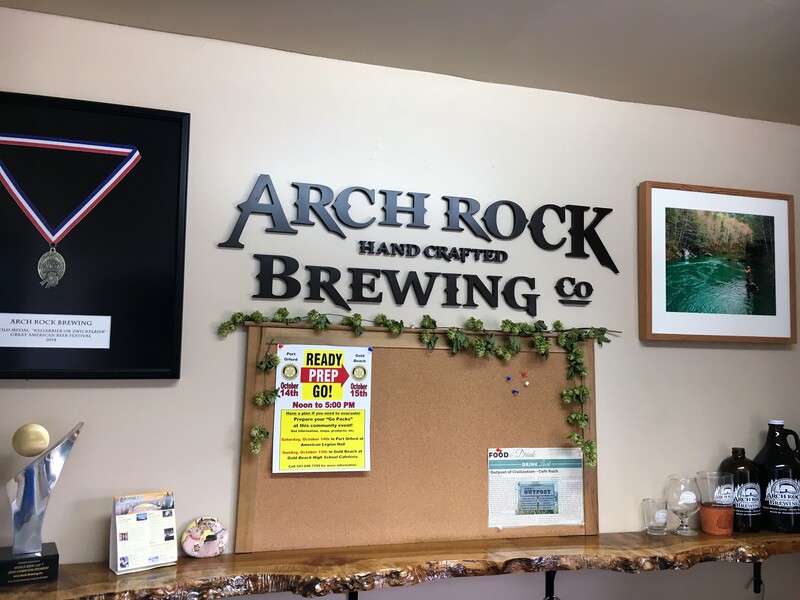 A few more miles to a short stop at Arch Rock Brewing in Gold Beach – this time to a four-year old partnership after the co-owners converted their cabinet shop into a brewery. 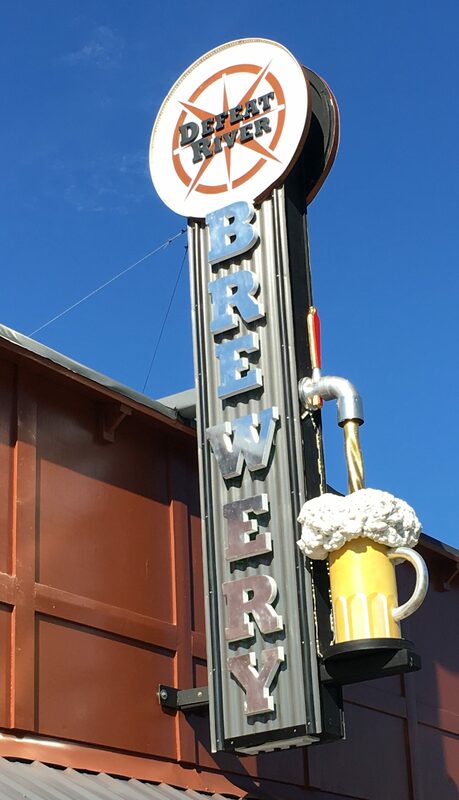 The brewer formerly worked at one of our favorite out-of-state breweries at which we tasted great beer – Grand Teton Brewing, which is actually in Idaho. Arch River currently brews only three beers, is not fancy and has no real taproom, but the owner was very friendly and helpful. 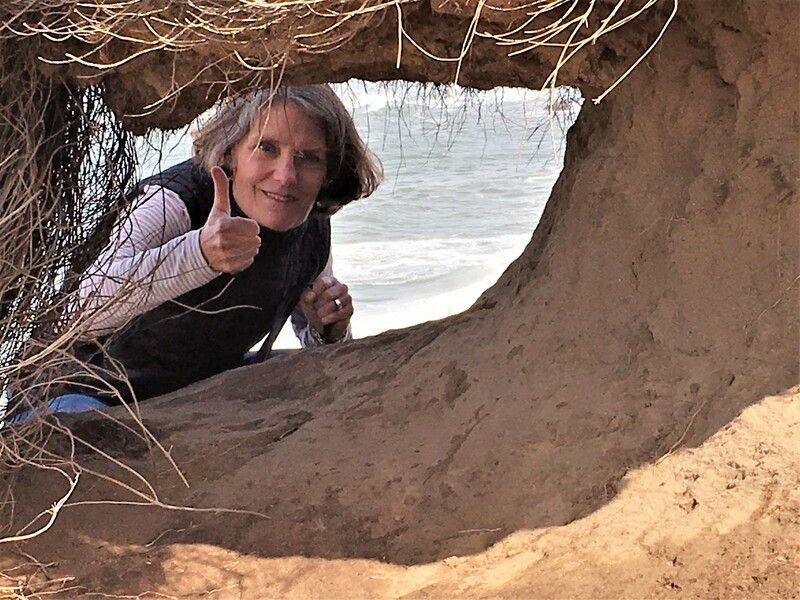 The best hike of the trip – even better than the beautiful several mile stroll through the Lady Bird Johnson Grove in Redwoods National Park was our three-mile loop along the cliffs at Cape Sebastian – the highest point on the southern Oregon Coast. Stunning views both north and south thrilled us as we walked through the waist high grass . Make this an absolute must if you hit this part of the coast on a nice day. 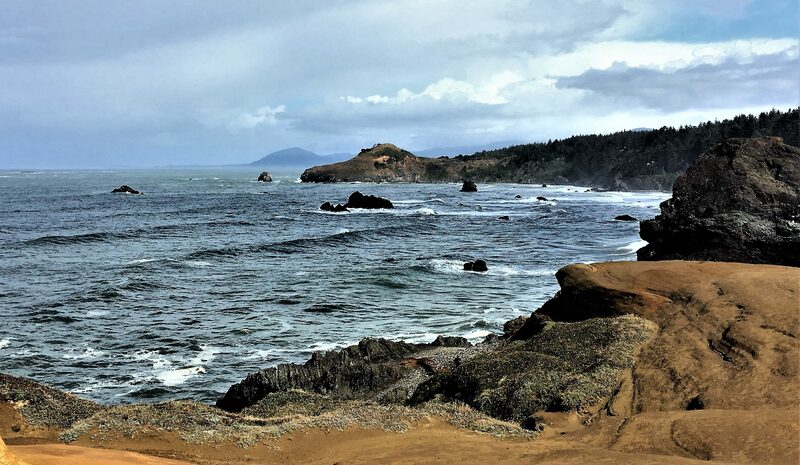 Coos Bay, is an interesting city that shows signs of having weathered some tough times in the new economy. lt was interesting to see the full-size posters of Steve Prefontaine, the City’s most famous individual decorate the sides of two adjacent buildings harkening back to his high school days at Marshfield High School before he set records at the U of O. Another Oregon grad who has helped the community is Annie Pollard, who did both undergrad and graduate work there before eventually partnering with Carmen Mathews to open the Seven Devils Brewing Co. in 2013. They are now an important part of the community. Only a block or two off 101, they have a very nice open patio and a quality taproom with a nice menu featuring locally-sourced food. 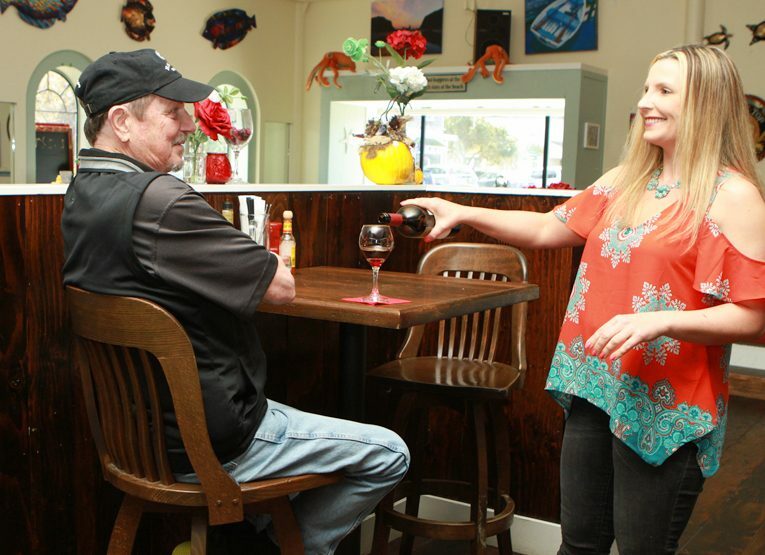 It is a family-friendly venue and they have free live music concerts every week featuring local and touring artists. A glass door reveals the sparkling brewing equipment, which is a nice touch. 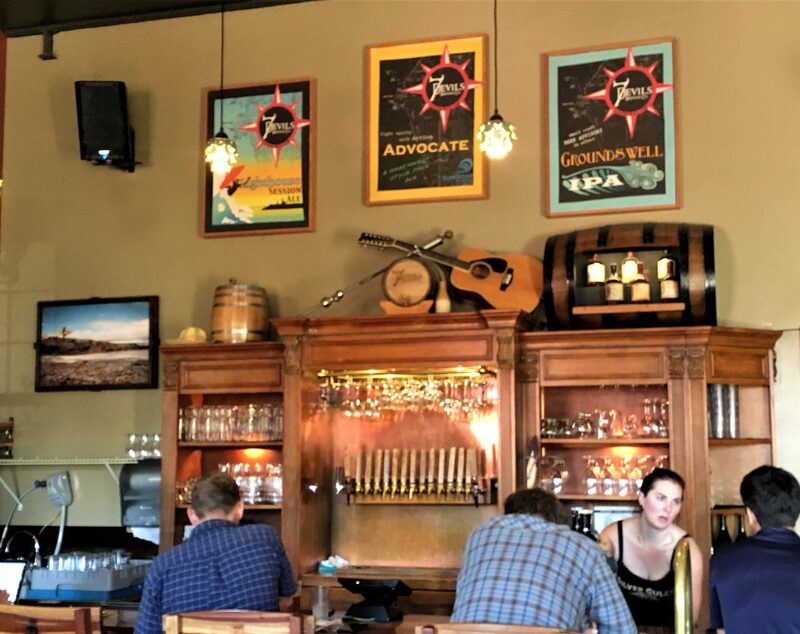 The ambiance is also heightened by the hand-made furniture and fixtures and the paintings, which make the barrel room and tap house quaint and comfortable. An overnight stay in Bandon, – at first disappointing because the Bandon Brewery’s grand opening was delayed until the next day, but as a result, we met a wonderful person, Jessica, the young entrepreneur, who opened the Broken Anchor Bar and Grill almost next door, a little over a year ago. The place was packed on a weekday evening and she and her staff including a friendly waitress named Loofa, showed great customer service and their unique sauerkraut pizza was one of the hits of the trip. They have an expansive menu including both pub food and seafood. Their live music on weekends draws good crowds. 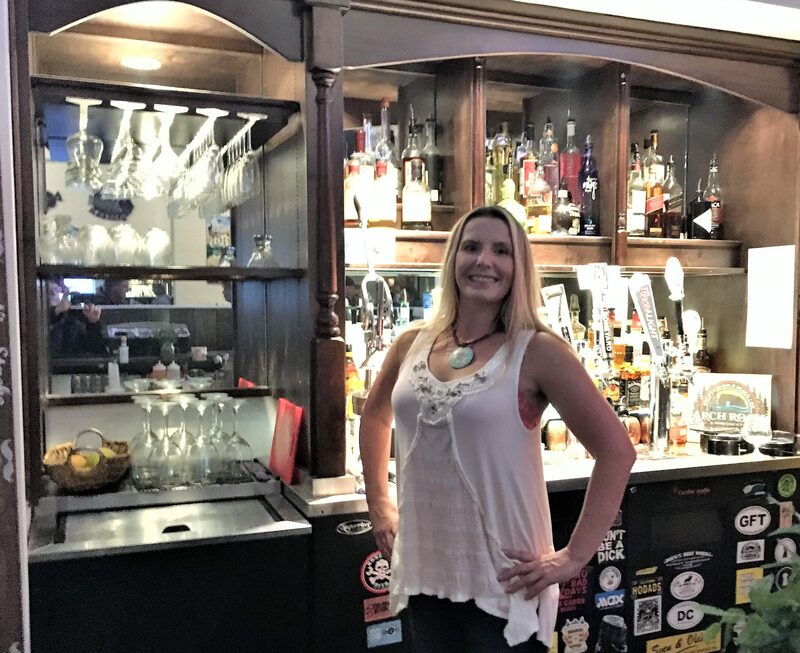 In spite of the full house, Jessica found time to chat while she was tending bar (and doing management stuff) and I found that she had worked at both Cracker Jack’s Pub and the Dixie Tavern in Portland -both prior stops on Thebeerchaser’s Tour of Bar, Taverns and Pubs. Crackerjack’s is one of the favorite neighborhood bars I’ve been to in the six years of this journey and Jessica even called the former manager, a charismatic lady named, Sam, while we were there and told her Thebeerchaser was in the house. Jessica, a Minnesotan, who after college and getting her teaching certification, started working in restaurants and bars (and according to the reviews, she knows how to make an outstanding cocktail) and is typical of the personable and enterprising people I have met since starting this hobby in 2011. 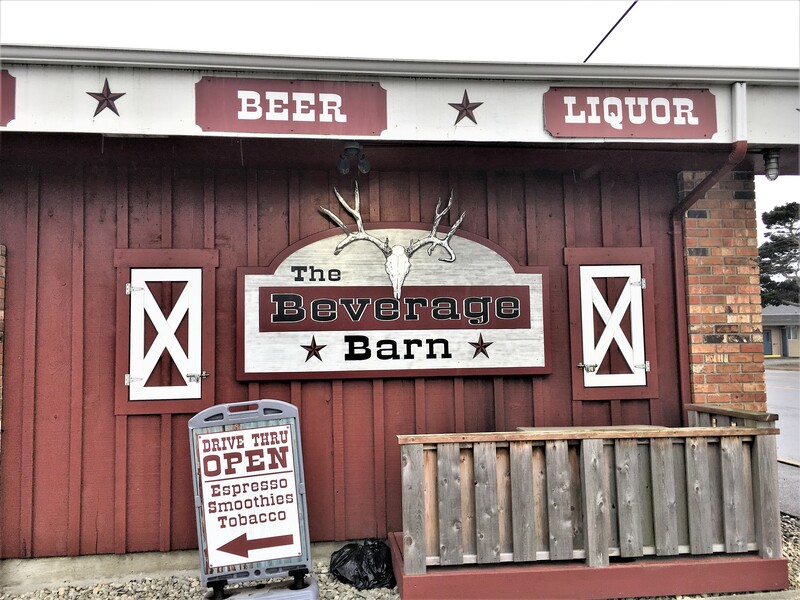 Another interesting stop in Bandon was the Beverage Barn, essentially a bottle shop and tobacco family business opened in 2015. 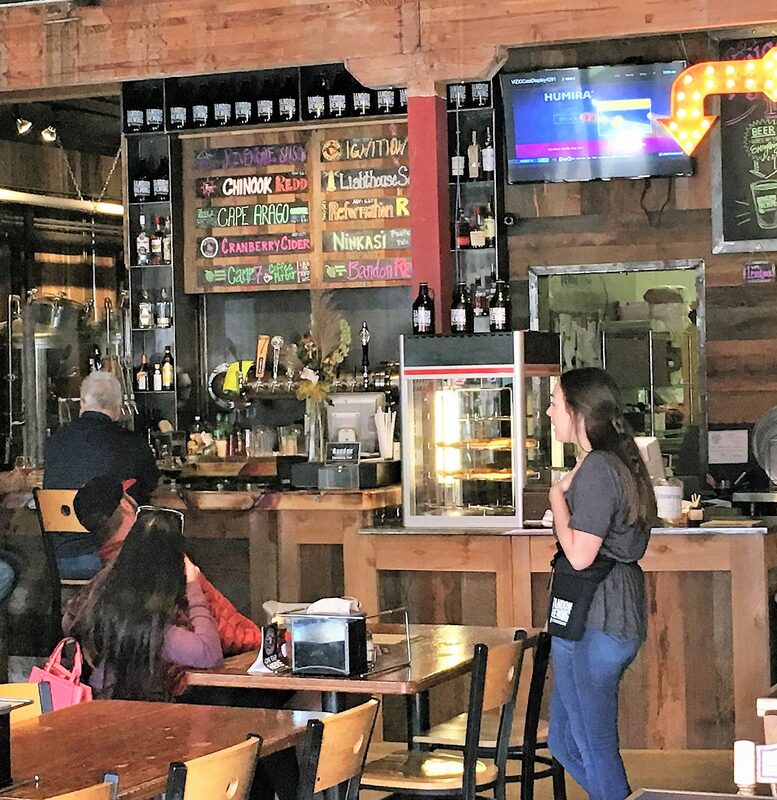 You can find forty beers on tap and four ciders as explained by Amy who helped us. 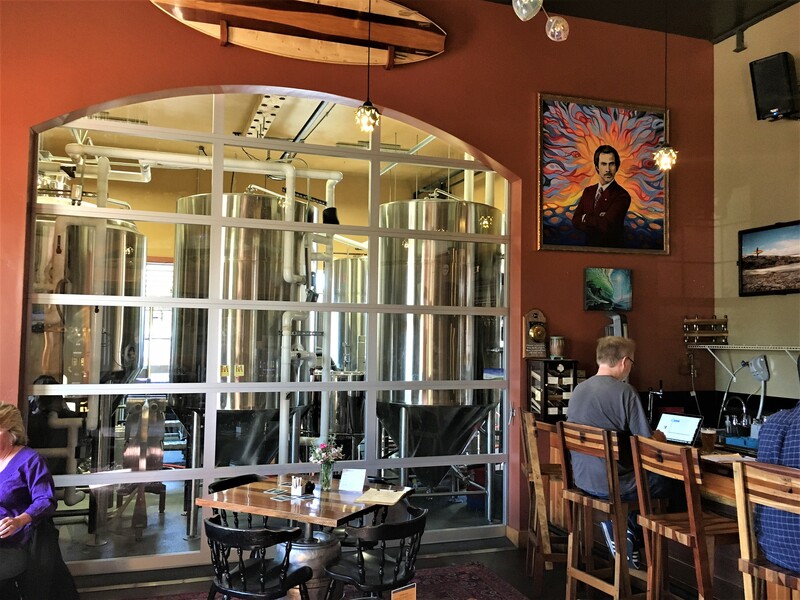 Bandon Brewing – open for business! Coming back through Bandon (this time on the return trip), we hit the Bandon Brewery on its second day of operation – for lunch. 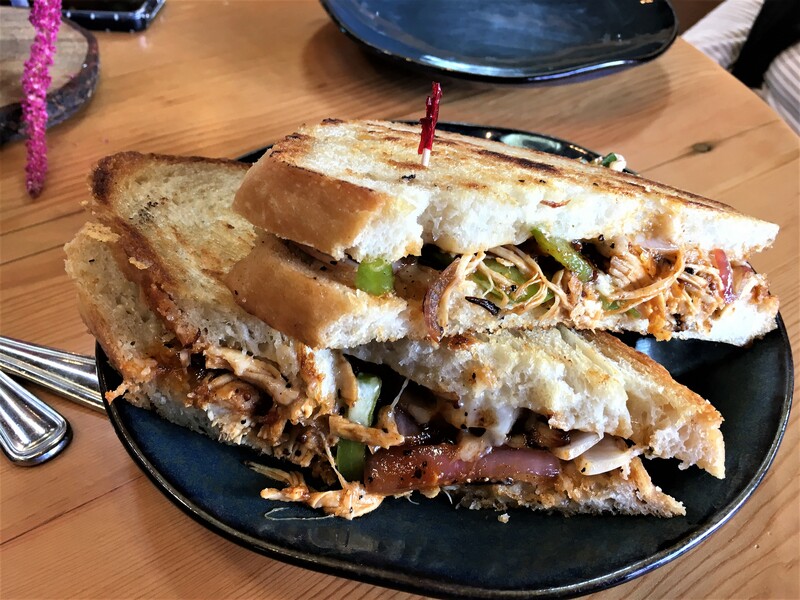 Their wood-fired pizza was solid as was their grilled cheese sandwich and the friendly staff was ready for their first weekend. 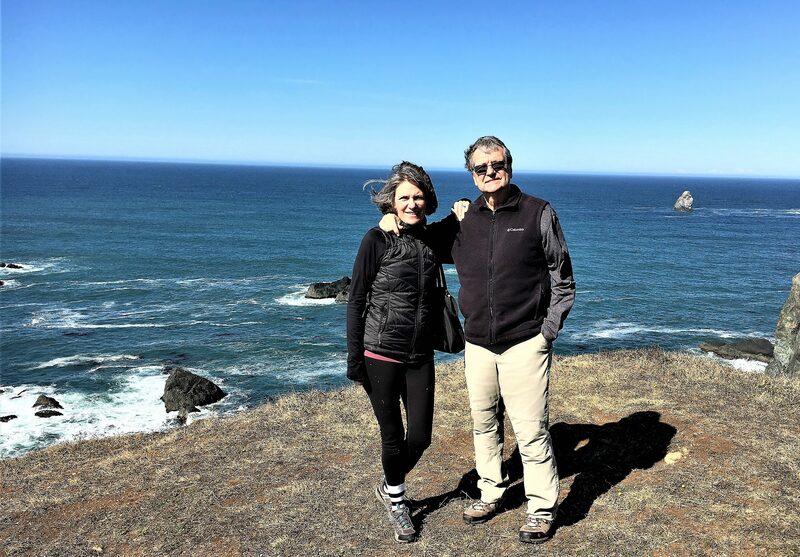 With a stay at the Bandon Inn, a nice motel with a great view of the town and the harbor, ended our first day on the road on this trip – a great combination of brews, bistros, beaches and …..coffee! Stay tuned for the rest of the Oregon and California part of this journey.